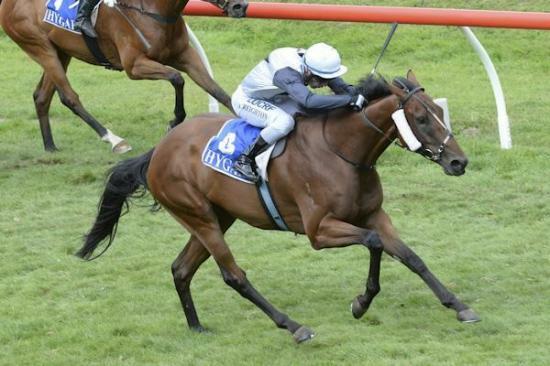 The Hanging Rock Cup, an iconic entry on the Victorian racing calendar, has been a mixed bag for us - Loukoumi winning the time honoured race in 2014 and passing away after breaking down badly in his attempt for a second victory last year. And it didn't look like it was going to be a happy hunting ground for us this year also, Laundered - favourite on the strength of his first up victory at Geelong - having no luck at all from a tricky gate. Doing it tough out wide, Laundered had to make his run early and he was off and running well before the turn - well and truly entitled to stop after working so hard to get to the lead so early. But he just kept going - and going strongly, giving an almighty kick in the run home and saluting by a soft 2 3/4 lengths with plenty in hand. Raced by RWH Thoroughbreds (manager Joanne Malloy), Andrew Nitschke, M Webb, Ron Webb, Martin Talty, Charmaine Talty, Gary North, Stephen Nielsen, Womens Business No 2 (Mgr: Mrs C M Blandford), Andy White, Peter Edgcumbe, Steve Peter-Budge, Malcolm Steward and Vicki Richards., Laundered has raced only six times and has now won three races. A son of consistent Danzig stallion Hard Spun and the very good broodmare Clear Money, he is a half-brother to six winners including the Gr.2 winning sprinter Tesbury Jack and the multiple city winner Charlottes Mint.